Of course I also separately downloaded and used jta.jar and the mysql driver. The book has a one to many relationship with the author object with one book being written by serveral authors. You need to run the following scripts for database intialization: I have used the same database named “authors” for this purpose. assigned: lets the application to assign an identifier to the object before save() is called. This is the default strategy if no generator element is specified. By the way, I would like to add something: I get a classic Lazy Initialization Exception if I don’t declare the set in Book.hbm.xml as lazy=”false”, that is I let it load non-lazy. This is a workaround and should be avoided as it could raise performance issues in critical situations. NoteLazy loading and can be achieved in hibernate using the lazy attribute. Lazy setting decides whether to load child objects while loading the Parent Object. You need to specify parent class.Lazy = true in hibernate mapping file. By default the lazy loading of the child objects is true. This make sure that the child objects are not loaded unless they are explicitly invoked in the application by calling getChild() method on parent. In this case hibernate issues a fresh database call to load the child when getChild() is actully called on the Parent object. But in some cases you do need to load the child objects when parent is loaded. Just make the lazy=false and hibernate will load the child when parent is loaded from the database. Examples: Address child of User class can be made lazy if it is not required frequently. But you may need to load the Author object for Book parent whenever you deal with the book for online bookshop. 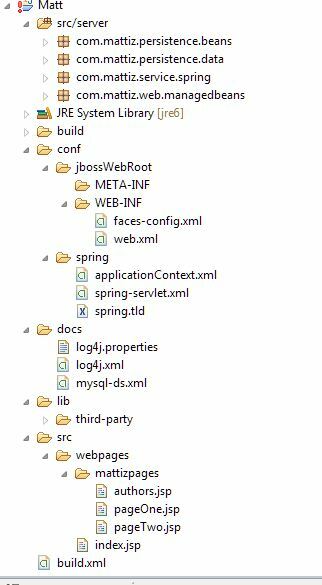 In the previous Hibernate example with mySQL, the datasource was configured in spring-servlet.xml http://cuppajavamattiz.com/2007/09/15/a-simple-spring-hibernate-example/ In this example we do away with spring-servlet.xml and instead use a combination of mysql-ds.xml and applicationContext-data.xml to configure the datasource. We also add ehcache-1.2.4.jar to lib/third-party from spring-framework-2.0.6-with-dependencies/lib/ehcache in spring-framework-2.0.6-with-dependencies.zip that comes with the spring distribution. You can configure JNDI instead of datasource in spring configuration file using “org.springframework.jndi.JndiObjectFactoryBean”. applicationContext-service.xml replaces applicationContext.xml in the original application while the source remains unchanged. Rest of the files is reused and no other modification is made.